Using SLAC’s Linac Coherent Light Source, a team of physicists discovered never-before-seen behavior by electrons in a material called striped nickelate, representing a new era in materials science research. An international team of researchers has used SLAC’s Linac Coherent Light Source (LCLS) to discover never-before-seen behavior by electrons in complex materials with extraordinary properties. The result is an important step forward in the investigation of so-called strongly correlated materials, whose unusual qualities and futuristic applications stem from the collective behavior of their electrons. By understanding how these materials work, scientists hope to ultimately design novel materials that, for instance, conduct electricity with absolutely no resistance at room temperature, dramatically improving the performance and efficiency of energy transmission and electronic devices. In a report published yesterday in Nature Communications, researchers led by SLAC Chief Scientist Zhi-Xun Shen and Lawrence Berkeley National Laboratory Scientist Zahid Hussain describe experiments at the LCLS with a material called striped nickelate. It gets its name from the pattern of alternating stripes of enhanced charge and spin that its electrons collectively assume under certain conditions. This pattern constitutes a new quantum state, and it provides a model system that scientists can use to learn about electron correlations and their impact on the properties of materials. The researchers hit the material with a pulse from an infrared laser, and then used an exceedingly intense, brief flash of X-ray laser light from LCLS – just a few millionths of a billionth of a second long – to record what happened. The initial pulse jarred the nickelate out of its striped state. By varying the interval between the two pulses, the researchers created images that showed how the charge stripes reemerged. They were surprised to find that variations in the locations of minimum and maximum charge, controlled by a quantity called phase, persisted long after the stripes’ charge distribution returned to its original magnitude. Other members of the research team come from the University of California-Berkeley, Lawrence Berkeley National Laboratory, Swiss Light Source, European X-ray Free-Electron Laser, Max-Planck Research Group for Structural Dynamics in Germany and the Tokyo Institute of Technology. Yesterday’s report is the fourth in the past six months describing experiments at LCLS that use pairs of optical and X-ray pulses to excite and probe materials that combine oxygen with so-called transition metals, such as nickel, copper, titantium or manganese. While these transition-metal oxides can have many fantastic properties, the one that has caused the most scientific excitement is the prospect of being able to conduct electricity without resistance at much higher temperatures than is possible today. Until 1986, all the known superconductors worked only at extremely low temperatures, limiting their usefulness. But that year, two Swiss scientists discovered that a copper-based oxide lost all its electrical resistance at 32 degrees Kelvin – about minus 400 degrees Fahrenheit. While this is still close to absolute zero, it was 12 degrees Kelvin higher than had ever been seen before. The Swiss researchers received the Nobel Prize in Physics the very next year. 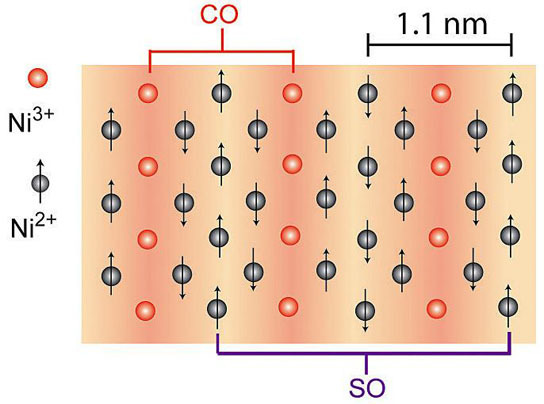 In a frantic worldwide scramble, scientists found dozens of transition-metal oxide combinations that became superconducting at even higher temperatures – up to 135 degrees Kelvin at atmospheric pressure. However, the dream of developing room-temperature superconductors for a new generation of magnetically levitated trains, superfast computers and super-efficient electrical power lines has not been realized, because no one knows why these complex materials behave as they do or how to predict their properties. Be the first to comment on "Electron Behavior Represents a New Era in Materials Science Research"